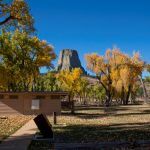 Ask fellow campers about "Devils Tower Nat'l Monument / Belle Fourche Campground" and nearby attractions. Access to the park will be better soon. The roads were under construction and traffic was being stopped for quite long periods. Once we were past the construction life was great. We paid our $20.00 park entrance fee and the $20.00 camping fee at the gate. This late in the season only the B loop was open. We chose the site second from last and our door opened up the an amazing view of the tower. All sites are graveled pull through. On the other side of the vehicle barrier is a table and fire pit. Our only complaint was that the site was pretty un-level side to side. We did not use the public restrooms nor did we stop to check them out. There are no stores or restaurants within easy walking distance. The park is clean and well maintained. We feel we received good value and would be back if in the area. We camped at Devils Tower Nat'l Monument / Belle Fourche Campground in a Motorhome. One must walk around the base of the tower. Like many National Park campgrounds, this is dry camping. No hook-ups or dump station (some services may be available for pay in the nearby KOA). The campground is basically at the foot of the Tower and many of the campsites have a great view. The road into the campground is paved. There are ample campsites to fit small and mid-sized RVs, with a fair number that would fit a larger RV. Check-in is self-serve - we paid in cash; I don't know if they take checks. There are no showers but the modern toilets are clean and well maintained. The visitors center is about 2 miles from the campground, and in season the staff gives regular presentations. Good AT&T cell service, but no wifi in the campground. We would very happily camp here again. Sorry, we didn't see any aliens! We camped at Devils Tower Nat'l Monument / Belle Fourche Campground in a Motorhome. The area immediately around the visitors center gets congested, especially if there are tour buses; if you have a toad, you may want to unhook and drive that in. There are very nice hiking trails. There's no camp store, although the visitors center has park souvenirs, but right outside the entrance are a couple of cafes/souvenir stores. This is a self-check in campground. But gorgeous view of Devil's Tower. Spacious, c-shaped pull-through sites along the road, our 33 ft. fit OK, not sure a big rig would. Really quiet, partially shaded. We camped at Devils Tower Nat'l Monument / Belle Fourche Campground in a Motorhome. No camp store, small town nearby. But Devil's Tower is right there when you look out the window. you come here to see devils tower. And see it you can. each campsite has a decent view of the tower. we had no problem navigating the roads with our 35' and toad. Big rigs might be a little tight but there are a dozen sites that could fit a big rig. All the sites are pull through. There are no showers but the modern toilets are clean. The camp host came by each day and they were all very friendly. we were here mid week and each night at dusk one of the rangers gave a presentation at the amphitheater. The campground is right next to a prairie dog field. The family had a good time just sitting and watching the prairie dogs play. as a national park it is rustic with no power, water or dump statoin. if you need these there is a KOA just outside the park with the same view and modern hookups for $15 more per night. We camped at Devils Tower Nat'l Monument / Belle Fourche Campground in a Motorhome. dont miss the prairie dog field. keep your eye on the tower at night, you will see night climbers. A nice campground at Devil's Tower NM. No hook ups at sites, but had water nearby. Had a nice view of Devil's Tower from our site and lots of trees and open areas, the roads are paved. 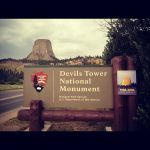 We camped at Devils Tower Nat'l Monument / Belle Fourche Campground in a Travel Trailer. This was a very low key campground. We arrived late and setup, and had our choice of spots. Had a great site with view of the tower. We were tent camping, and the spot was level. We cooked brats over an open fire (grill was available for charcoal) and ate at the provided picnic table. Nice friendly place. The camp staff was very friendly and helpful. Plus the staff was showing Close Encounters of the Third Kind. Looking forward to coming back again. We camped at Devils Tower Nat'l Monument / Belle Fourche Campground in a Tent. We started the day at Mount Rushmore, so it is a couple of hour drive away. Got up early and hiked around the tower. There were no crowds, in fact outside of the initial parking lot, we did not see anyone on the back side. If I had more time, I wold have spent an extra day and explored a longer trail. Great NPS campground. It filled up at night, so get there by mid afternoon at the latest. No hookups but large sites. The pull through site was plenty big for our 34 foot trailer and tow vehicle. Great view of the tower from campsite. No fires due to dry hazardous conditions at the time. Fee was 50 percent discount with Sr. pass. Would stay again. We camped at Devils Tower Nat'l Monument / Belle Fourche Campground in a Travel Trailer. No services available at this CG. Restrooms were a bit dated but very clean. Water was available at the restroom building only. Lots of cottonwood trees that allowed for shade on some sites. Close to Devils tower. We camped at Devils Tower Nat'l Monument / Belle Fourche Campground in a Fifth Wheel. The tower trail hike around the tower was nice but for a better view of the tower with the surrounding grasslands, take the Joyner hike. We were the only folks on the trail....wonderful views, quiet. Good pull through sites. Firepit, picnic table. Great views of Devil's Tower. Only 2 miles from Visitors Centre. Great place to stay to see the Tower in the morning and evening light. Various hiking trails. We camped at Devils Tower Nat'l Monument / Belle Fourche Campground in a Travel Trailer. No hook ups - no problem! We had site B14 which was at the back and it was perfectly quiet with a view of a lovely field. We were in easy distance from Devils Tower - across the road and straight up. Lots of cottonwood trees provided shade for nearly all sites. Our site, as well as most of the others, was pull through. Dogs are not allowed on trails so we weren't able to do that. The host was very nice and introduced himself as we checked in. We'd definitely return. 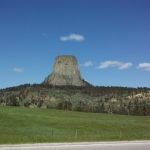 We camped at Devils Tower Nat'l Monument / Belle Fourche Campground in a Motorhome. We arrived here knowing this would be dry camp, but found the threads on the water faucets at the bathhouses were milled off. (This was before I discovered the Water Bandit.) We had to go back out to the KOA and pay $10 for a water fill. We returned and selected a level pull-through on the outer edge facing the Belle Forche River. The campground filled up with a mixture of tenters and RVs including two bus-loads of high school students, but they proved to be well-behaved and presented no noise problems. Despite it being primitive I loved this place. The Tower was right outside our window. We camped at Devils Tower Nat'l Monument / Belle Fourche Campground in a Travel Trailer. Take a scenic hike along the Belle Forche River, but you'll have to cross a fence and there are no trails. Great park, large cottonwoods and grass. Great view of Devils Tower. Our rig is 35', only a few of the sites would fit large rigs. Free fire wood was nice. 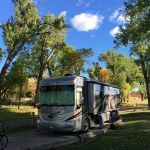 We camped at Devils Tower Nat'l Monument / Belle Fourche Campground in a Fifth Wheel. Hikes in vicinity of Tower were nice. Paved loop at base of Tower was 1.2 mile, easy. Nice area. Rate is with Senior Pass discount. Easy to maneuver our 33' RV through the loop and park in site B28. There are no hookups at any of the sites. Nice view of Devils Tower. We stayed one night. We camped at Devils Tower Nat'l Monument / Belle Fourche Campground in a Motorhome. Great views of the tower, plenty of shade, and free firewood in a bin for a great campfire made this a winner, along with the low NPS senior discount rate. While not fancy, this park was well tended, with a recently replaced picnic table and grill, and a work crew was mowing and clearing. Summer ranger programs at the amphitheater near by. Note this campground is first come, first served, no reservations. Would stay here again. We camped at Devils Tower Nat'l Monument / Belle Fourche Campground in a Motorhome. Are you affiliated with Devils Tower Nat'l Monument / Belle Fourche Campground ?